This page presents a summary of the plot and characters of Martin Chuzzlewit, a novel by Charles Dickens. Martin Chuzzlewit (Full Title: The Life and Adventures of Martin Chuzzlewit) was a novel by Charles Dickens, published immediately after The Old Curiosity Shop. It appeared in serial form, published in 19 instalments. Dickens said that he considered Martin Chuzzlwit to be his greatest novel, but the book did not enjoy great commercial success. 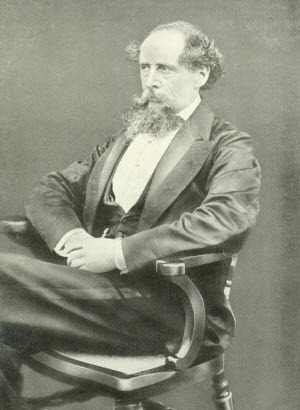 In fact, when the first few instalments were published, the sales were so poor that Dickens' publisher dropped him and demanded repayment of their advance. The novel was illustrated by Phiz, Dickens' longtime illustrator. Martin Chuzzlewit is a picaresue novel, which follows the genre convention of depicting the homorous adventures of a roguish hero of low social class who lives by his wits and corrupts society. As in most picaresque novels, the primary objective is social satire or criticism. Old Martin Chuzzlewit, is very rich and very old; he is convinced that his relatives are only interested in his money and cannot wait for him to die so that they can inherit his fortune. Chuzzlewit develops a scheme to thwart what he thinks are his relatives designs: he takes in an orphan named Mary, whose job is to be his nursemaid. Mary will be well taken care of and live comfortably only so long as old Martin Chuzzlewit is alive, but as soon as he dies, she will be thrown out onto the streets without a penny. In this way, old Martin Chuzzlewi thinks that he can motivate Mary to take good care of him and help keep him alive, in contrast to his greedy relatives who he thinks want him dead. Chuzzlewit's plans are thwarted when his grandson and heir, Martin Chuzzlewit Junior, falls in love with Mary and wishes to marry her. Fearing that Mary will therefore have a reason to benefit from his death, the old man orders his grandson to break off the engagement, but the younger Martin Chuzzlewit refuses. In a rage, the old man disinherits his grandson, who must then fend for himself in a hostile and greedy society. 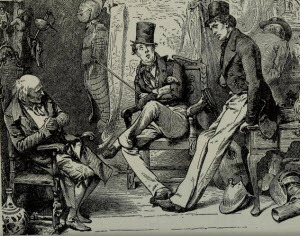 The young Martin Chuzzlewit tries to make his way in the world by becoming an apprentice to the villainous Mr. Pecksniff, a relative of his grandfather. Pecksniff is one of Dickens' great villains: he is talentless, full of himself, falsely pious. He periodically takes in students, offering to teach them architecture and then lives off of their tuition fees while teaching them nothing and stealing their ideas. Pecksniff has two daughters, Mercy (Merry) and Charity (Cherry). Charity is very much like their father and exhibits none of the good qualities for which she is named. Her sister Merry is at first giggly and flighty, but later loses her shine when she marries an abusive man, Jonas Chuzzelwit (who is the nephew of Old Martin Chuzzlewit). While in the service of Pecksniff, Chuzzlewit befriends Peksniff's servant Tom Pinch, an idealistic and innocent young man who is in some ways the main character of the novel. When the elder Martin Chuzzlewit hears that his grandson is apprenticing to Mr. Pecksniff, he demands that Pecksniff kick the younger Chuzzlewit out immediately, which he does. The old man then moves in with his relation, together with his nuresemaid Mary, and promptly falls under the complete control of the villainous Pecksniff and his daughters. Meanwhile Tom Pick also falls in love with Mary (Something About Mary?) but refrains from expressing his feelings because he knows that his friend Martin is in love with her too. Pinch idolizes Mr. Pecksniff, but eventually comes to see him for what he really is: an avaricious user. Pecksniff then dismisses his servant. Pinch eventually finds new employment with the mysterious Mr. Fips, whose true identity is not revealed until the end of the book. Young Martin Chuzzelwit decides to try to make his fortune by travelling to America. He journeys there in the company of his friend Mark Tapley. Tapley is always cheerful and as an experiment decides to see if it is possible for him to remain cheerful under the worst of circumstances: he accompanies you Chuzzlewit to the United States as Martin's unpaid servant and in fact spends all of his savings financing the trip. While in the United States, the pair are taken advantage of by greedy swindlers and charlatans. They eventually try to settly unuccessfully in a malaria infested settlement called Eden in the midst of swampland, before finally giving up and returning to England. 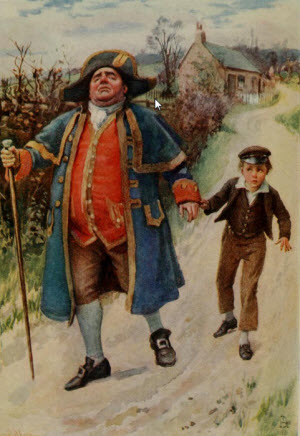 On his return, young Chuzzlewit begs his grandfather for forgiveness but the old man rejects him coldly. In the meantime, Mr. Pecksniff has become involved in a pyramid scheme involving Tigg Montague. Montague is a low life petty thief, who pretends to be a gentlemen, having financed the purchase of fine clothes by stealing a watch from young Chuzzlwit. Montague's phoney appearance of success is enough to convince investors that he is legitimate, and in the end many are ruined. Montague also blackmails Jonas Pecksniff, because he knows that Jonas murdered his father (Old Martin Chuzzlewit's brother). Withe the Monatgue pyramid scheme failing, Jonas murders Montague in order to hide the secret that he also murdered his own father. Young Martin Chuzzlewit is reunited with his friend Tom Pinch. Meanwhile, Tom Pinch discovers that his mysterious benefactor/employer is old Martin Chuzzlewit. The elder Chuzzlewit reveals that when he realized what greed could make people do, he decided to pretend to be senile in order to give everyone enough hope to hang themselves. In a soap operish type ending which is unworthy of a great novel, the group confronts Mr. Peksniff about his true character. It is also revealed that Jonas did not actually murder his father (although he thought he had). In fact Jonas's father died of a broken heart when he discovered that his greedy son wanted him dead. Old Martin Chuzzlewit also reveals that he was angry at the angagement between Mary and his grandson because he had wanted to arrange the match himself but felt insulted that the credit and glory had been stolen from him by the two making their own plans. At this point Martin and Mary are married. The good Tom Pinch never reveals his love for Mary, he never marries, and remains a good friend to both, and genuinely happy that his friends are happy. The end. You can read the full text of the novel here.